I’ve been meaning to reprocess the Lethem Rodeo montage picture for a while now. 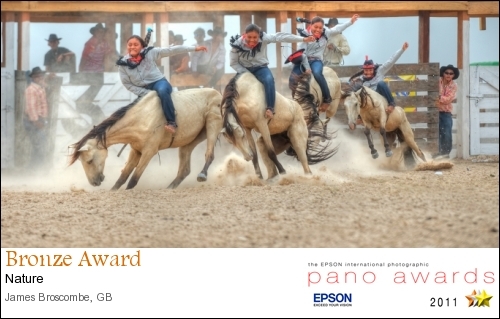 The Epson international panorama competition gave me a good excuse. It’s a slow business combining these four frames in photoshop, so it was nice to be given a Bronze Award for the final image. I also submitted a second image – This strange vertical panorama from Kaiteur Falls. Seemed like a good opportunity to present something a little different to the judges. It also got a Bronze Award.